After doing much research on what would work best for my eclectic needs, I decided the Platinum Pro EQ/DI was going to be my best bet. I use mine with acoustic lap steels with L.R. Baggs M1A pickups and a Strat with a passive Graphtech Ghost system. I have a Vox passive volume pedal, a Boss TR-2 Tremolo, and a Line 6 Verbzilla in the effects loop. The main selling points for me were 1) the super high 10M ohm input impedance as I use a passive piezo with it, 2) the on board compressor, 3) the variable high pass filter (as opposed to just a fixed setting), and 4) the on board tuner. With minor tweaks to the input trim, pretty much any pickup system is going to work with this pre-amp. The on-board compressor sounds much better for acoustic than a typical electric guitar compressor (to my ears) as it doesn't clip or "squish" as much; it sounds very natural and improves string balance and sustain. The footswitchable boost is useful for balancing between different guitars on the fly, but I like to leave it on at the lowest setting (+3db) because 1) I get a indicator that the unit has power as there is no power LED and 2) the boost is before the effects loop so it drives the pedal chain better, like an amp's effects loop would. The tuner is accurate and flexible as it has several modes, but it will forever stay set to A=440 and chromatic for my uses, anyway. The LCD backlight could be a little brighter for outdoor use, but I'm used to using Boss TU-3's on my other pedal boards with their brightness cranked up. My only other gripe is that the master volume does not control the XLR output, but I understand that they do that so if you were running the amp output to a stage amp it wouldn't affect the DI signal. That said, I plug mine into a QSC K10 via the XLR out, but that's why I have the volume pedal in the effects loop as none of my guitars have an easily accessible volume control, anyway. The tuner still mutes the DI signal, however, which is useful. Great pre-amp! .I've been frustrated for years, trying to get a natural amplified sound without distortion and feedback from my fiddle rig. I play in a modern Celtic band, and we use a variety of electric instruments. My difficulty has always been using and acoustic instrument with a pickup and competing with all the other noise on stage. 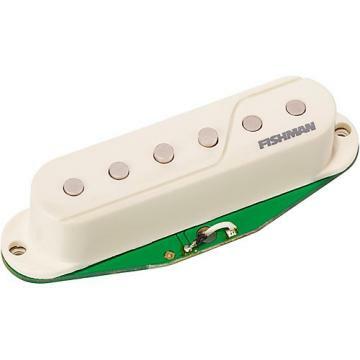 I tried the Fishman pre-amp at rehearsal and was blown away by how easy it was to integrate and the natural sound I was able to get. I gave four stars for now, because I haven't had a chance to test it at a gig yet. Once I do, I'm hoping to add that final star. .I've quickly incorporated the Platinum Pro EQ into my acoustic guitar signal chain. It took a few gigs to dial in the settings that I want, but it's super easy to use and sounds great! Haven't played a show with a proper FOH engineer, but I look forward to sending him or her the DI signal from the unit. Only drawback is that the tuner is pretty difficult to see when playing an outdoor gig in any kind of direct sunlight. This is true for most electronics, so no surprise there. 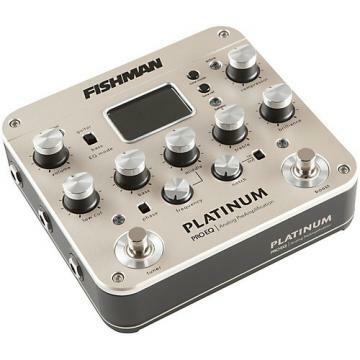 .I bought this to couple to a powered speaker or PA for my acoustic guitars and pleasantly found out that it can be used for other electrical instruments. Very low noise level.